But when, O Wells! thy roses came to me/My sense with their deliciousness was spell’d:/Soft voices had they, that with tender plea/Whisper’d of peace, and truth, and friendliness unquell’d. Thanks to a curious string of coincidences, Wells junior also had several links with the world of literature. 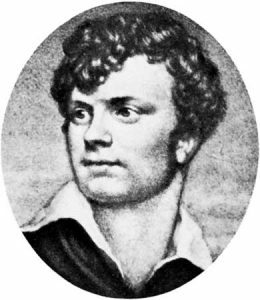 When he was a few weeks old he was baptised by the Rev Francis Thackeray, an uncle of William Makepeace Thackeray (author of Vanity Fair). At around the time when he broke the bank at Monte Carlo he moved to a luxurious apartment in Great Portland Street, London: this same address had earlier been the home of Baroness Orczy, of Scarlet Pimpernel fame. And a building in Paris, from which he later operated a major financial scam, had been the birthplace of Alexandre Dumas fils, (son of the author of the Three Musketeers and the Count of Monte Cristo). Charles Deville Wells seems to have few literary pretensions of his won, though some of the prospectuses he created to lure people into his money-making schemes were acclaimed in the press as the work of a genius. 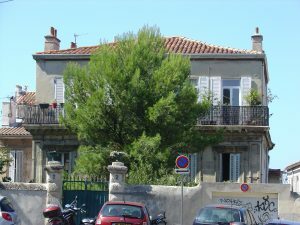 Charles Jeremiah Wells and his wife lived at this house in Marseille, 2 Montée des Oblats (since renamed rue Vauvenargues). The property was probably bought for them by their son, Charles Deville Wells. Hitler’s Last Army – which came out in 2015 – now has seven five-star reviews on Amazon. My thanks to those who have made such kind and positive comments, and I’m delighted that they have found the book interesting. Fully agree with all the glowing reviews, and note too the ex POW reviewers find that it does justice to their own experience. Like the others, I couldn’t put this down either. It’s well written, interesting, informative, and heart-warming in equal measure since the author interweaves personal experience with the wider story of government policy. As a WW2 obsessive, I’m always on the lookout for books that give us a different angle, or about subjects not well covered previously. This fitted the bill perfectly. The author does not gloss over the less creditable aspects of the mens’ treatment in British hands but I bet many others had a smile on their face like I did by the time I finished it, because you like the people and their stories. I would recommend this even to those not especially interested in WW2, as a fascinating slice of Anglo-German social history of 70 years ago. Buy it. When writing the book I had taken particular trouble to locate first-hand witness accounts from former prisoners. I carried out a number of face-to-face interviews and also used memoirs from the Imperial War Museum and other sources. My aim was to set these against the historical background of the time. 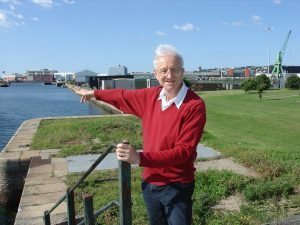 It wasn’t always easy, but – if J. Barry’s review is anything to go by – it seems to have worked! People often ask how I got the idea for this book. A few years ago I was researching some completely unrelated topic in an old newspaper from the 1920s. I spotted a paragraph which said something like ‘Man who broke bank at Monte Carlo dies in poverty.’ It grabbed my attention because I knew there had been an old song about the man who broke the bank, but I’d never had the faintest idea that he was a real person till that moment. And then I wondered what could possibly have happened for him to finish up in poverty. I discovered that Charles Deville Wells broke the bank in 1891 and won very large sums of money at roulette and at a card game, trente-et-quarante. It was pretty obvious from the reports that he really had broken the bank, but also that he was a fraudster. That made me wonder how he’d done it. The details seemed very sketchy, and newspaper articles about him often contradicted one another. When I told my editor at The History Press that there had never been a previous biography of Charles Wells, he could hardly believe it — and I felt the same. So we knew that this would be a first. Now, in one way that’s very good news for an author, as there’s no direct competition. But on the other hand, it meant that I’d have to reconstruct Wells’ life from scratch. I started with a timeline. And I remember the first version of it was a half sheet of A4 paper with about seven entries, beginning with his birth and ending with his death – and even the details of those events weren’t known for certain. I wasn’t sure how long it would take to find the whole story, or whether it would be possible to fill in all the gaps. But the timeline finished up as a hefty document nearly 200 pages long, with over 700 separate entries representing just about every known fact about Charles Deville Wells. And then it was a matter of putting it all in order – making sense of all the material. And sorting out all the discrepancies and contradictions in the basic material. That took months. 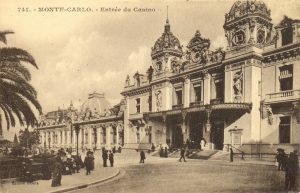 It was in July 1891 that Wells went to the casino at Monte Carlo – the only place in Europe where gambling was legally permitted at the time. He arrived at mid-day and started to gamble at the roulette table. And in the course of eleven hours he broke the bank – not just once but several times in a row. And then, on subsequent days, he did exactly the same again. In less than a week he had won £40,000, worth £4 million in today’s terms. Even now, 125 years later, no-one is quite sure how he achieved this seemingly-impossible feat. Some claim that, as an engineer, he could have discovered a slight mechanical imperfection in one of the roulette wheels, enabling him to predict which numbers to bet on. Other observers speculate that, as a fraudster, he had probably devised a way to swindle the casino. Wells himself dismissed these accusations, claiming that he had invented an infallible system of gambling which involved watching for recurring sequences of numbers before placing his bets. To me, though, none of these explanations seemed convincing, and I set out to solve the mystery. 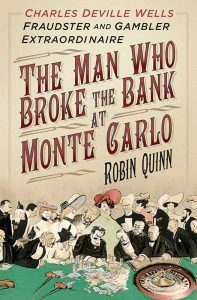 After studying all the available evidence, I was finally able to offer a plausible explanation based on the known facts, and I’ve set out my findings in a new book, The Man who Broke the Bank at Monte Carlo. Legend has it that, after his Monte Carlo triumph, Wells and his French mistress were regular guests at the London and Paris Hotel in Newhaven, stopping there en route between Britain and France. They were in the habit of holding riotous parties which went on until the early hours of the morning and kept the other visitors awake. When the hotel management asked Wells to take his custom elsewhere, he rented a nearby house in Fort Road … where the festivities continued uninterrupted. 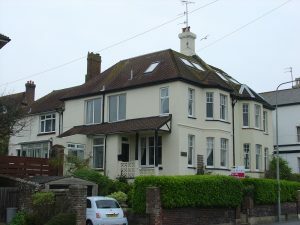 The house in Fort Road, Newhaven, where Charles Deville Wells is reputed to have lived after his Monte Carlo win. Most of the research for The Man who Broke the Bank at Monte Carlo took place in the summer of 2014, when I visited Paris, Marseille, Nice and Monte Carlo to follow in the footsteps of the man himself – Charles Deville Wells. I followed up almost a year later with a second trip, this time to Le Havre, where Wells arrived in 1892 on his huge yacht, the Palais Royal. It was while he was here, in company with his beautiful French mistress, that he was arrested by French police – a story that’s related in full within the pages of the book. Today the Quai de la Seine is one of the smaller docks and appears to be virtually unused – or perhaps it was just a quiet day when I visited. The larger vessels using the port now use the more extensive facilities elsewhere, but this was probably a place of some considerable importance in the 1890s when Wells was here. The Palais Royal, almost 300 feet long, was one of the largest pleasure craft in the world at that time, and would have occupied half the length of the basin. 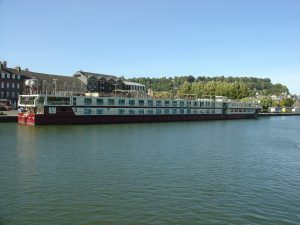 While on the same trip I spotted a boat used for river cruises which was just slightly larger than the Palais Royal. It gives some impression of the scale of Wells’ yacht. 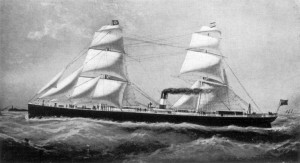 Charles Wells’ yacht, Palais Royal (formerly the cargo ship Tycho Brahe).